To messers Nehemiah Dodge, Ephraim Robbins, & Stephen S. Nelson, a committee of the Danbury Baptist association in the state of Connecticut. The affectionate sentiments of esteem and approbation which you are so good as to express towards me, on behalf of the Danbury Baptist association, give me the highest satisfaction. my duties dictate a faithful and zealous pursuit of the interests of my constituents, & in proportion as they are persuaded of my fidelity to those duties, the discharge of them becomes more and more pleasing. Believing with you that religion is a matter which lies solely between Man & his God, that he owes account to none other for his faith or his worship, that the legitimate powers of government reach actions only, & not opinions, I contemplate with sovereign reverence that act of the whole American people which declared that their legislature should "make no law respecting an establishment of religion, or prohibiting the free exercise thereof," thus building a wall of separation between Church & State. [Congress thus inhibited from acts respecting religion, and the Executive authorised only to execute their acts, I have refrained from prescribing even those occasional performances of devotion, practiced indeed by the Executive of another nation as the legal head of its church, but subject here, as religious exercises only to the voluntary regulations and discipline of each respective sect.] Adhering to this expression of the supreme will of the nation in behalf of the rights of conscience, I shall see with sincere satisfaction the progress of those sentiments which tend to restore to man all his natural rights, convinced he has no natural right in opposition to his social duties. I reciprocate your kind prayers for the protection & blessing of the common father and creator of man, and tender you for yourselves & your religious association assurances of my high respect & esteem. 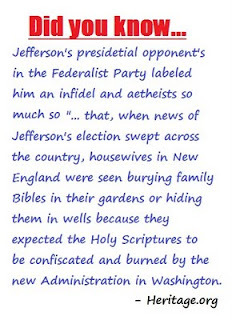 Undoubtedly unknown to Jefferson at the time, this is perhaps one of the most influential letters in world history. Referred to in Supreme Court cases in 1878, 1947 and 1948. Complained about by Justices in 1962 and 1985. And influencing the set-up of democracies in our lifetime. The founding fathers had a vision for America to be so free that not one citizen was to not be hindered or feel compelled to worship. So different from scores of centuries of kingdoms that aligned themselves to either Roman Catholicism or Islam. Which still goes on today as in the case of Poland in 2011. This vision was certainly keeping right in line with the reason some of the first European immigrants came to this land. For freedom of worship. The first and true American dream. How the American dream was downgraded to owning your own property/home was no doubt a marketing scheme motivated by financial or political gain. So important to the U.S. Constitution framers it was the first thing brought up in the Amendments. But did'ja notice? 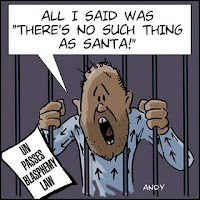 It say's "religion" in the amendment. I believe many Americans in service to our young nation of that time had a better grasp of the Truth of the Scriptures than most of their counterparts today as most today are practicing some form of religion or none at all. Religion is man made forms of worship. By it's very definition in our language today it doesn't mention God at all. Just "a set of beliefs concerning the cause, nature, and purpose of the universe, especially when considered as the creation of a superhuman agency or agencies, usually involving devotional and ritual observances, and often containing a moral code governing the conduct of human affairs". - Dictionary.com There is a difference between living Truth and practicing religion as shown in Perceptions. There were many battles won by the Continental Army many even still today consider miraculous. The thinking expressed in the documents that began and established our nation you have to at least admit shows original thinking, if not a Supreme design, in what they proposed for a central government. These men had a working knowledge of Truth and framed our nation with it. 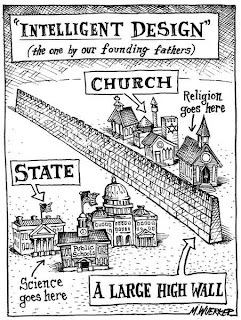 Is The United States of America a "Christian" nation? I guess that would depend on what your definition of the word "is" is. You have the freedom to choose and you could honestly go either way. Yes in that It means this nation is based on principals of Truth, An example of God's heart to man expressed in His Word. His desire He has for people to be free to choose to live our lives the way we see fit. (And it's not His fault that we allow evil into our lives that messes up His promises to us either!) No in that Congress cannot pass laws concerning worship. Congress cannot express favor or prejudice on how its citizens worship. Period. Congress cannot endorse any man made forms of worship. This is expressed in the First Amendment is a most dynamic way. But that does not mean they can't fulfill the responsibilities of their office(s) with a knowledge of Truth they that have made their own. I would say yes. The U.S. Constitution is rooted in the scriptures. We are a Christian nation. But not pushy about it! Too bad so few people in public service have this knowledge of Truth today. This is what would cause them to be true leaders instead of the politicians we have in our current time. I am concerned that those that do hold public office without a knowledge of the Truth of the Scriptures will continue to push their agendas based on the carnal knowledge they do posses. It is this approach to governing that has taken our country, The United States of America, off the trail blazed for it by those that established it. Instead of governing with a meekness to the Creator, with the Truth of God's Word as a guide, we are today governed by what man perceives as "best" for us. Anything based on carnal knowledge will not stand, will not be profitable and will lead to loss. One benefit in understanding God's Word is that the stories of the Old Testament is God's example of how governments are to govern. 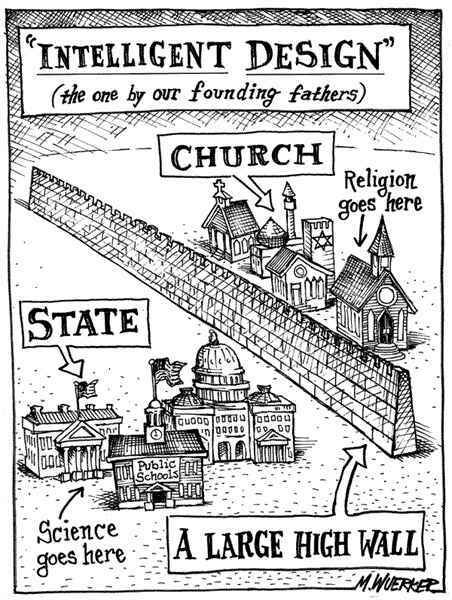 In the Old Testament however there is no separation of church and state. At that time all nations were known by the gods they worshiped. Israel was a nation of believers, chosen of God by His promise to Abraham. There are many cases shown however that when Israel separated itself as a nation from Truth and practiced religion they fell into slavery. When they forsook religion and came back to the Truth they prospered. 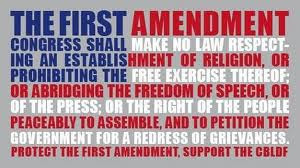 The benefit of the first sentence in the first amendment to American citizens today is that... although all forms of man made worship is free to be practiced, the Truth of God's Word cannot be squelched by the federal government, Congress or the Presidency or the Supreme Court by allowing this nation to endorse or restrict any form of religion. These men that established our nation saw that no form of governing would perfect a person. In a free society that is not government's role. It is indeed a personal decision to do so. After all... each and every person not given to Truth will have to answer for his or her life. And if these people have children that die too young to be considered an adult, they'll have to answer for their children as well. It is not government's role to play God. Endorsing or restricting a religion, a man made form of worship is playing God and these early patriots wanted none of that. And that my friends is a wonderful example of leadership. To know when to stay out of the way! A brilliant stroke of genius! U.S. Constitution Library of Congress The Mythical "Wall of Separation"
Donators Recognition Donators recognizedby permission. Anonymous requests respected. For more information refer to Sponsorship Information.